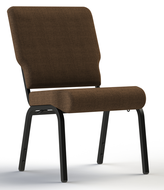 Looking for church chairs to replace traditional pew seating? Are you starting into your first worship area and need the flexibility to change it's function quickly? ChurchPartner has many discount church chairs for sale at wholesale prices. Why buy church chairs that aren't designed to replicate the pew when our chairs for church connect together, interlocking into continuous pew-like seating. We have both metal framed church chairs and wooden church chairs that are stacking and padded. These beautifully upholstered church chairs are available in a variety of fabrics and wood or metal frame finishes.Why settle for cheap church chairs when we offer quality chairs for churches at discounted prices.